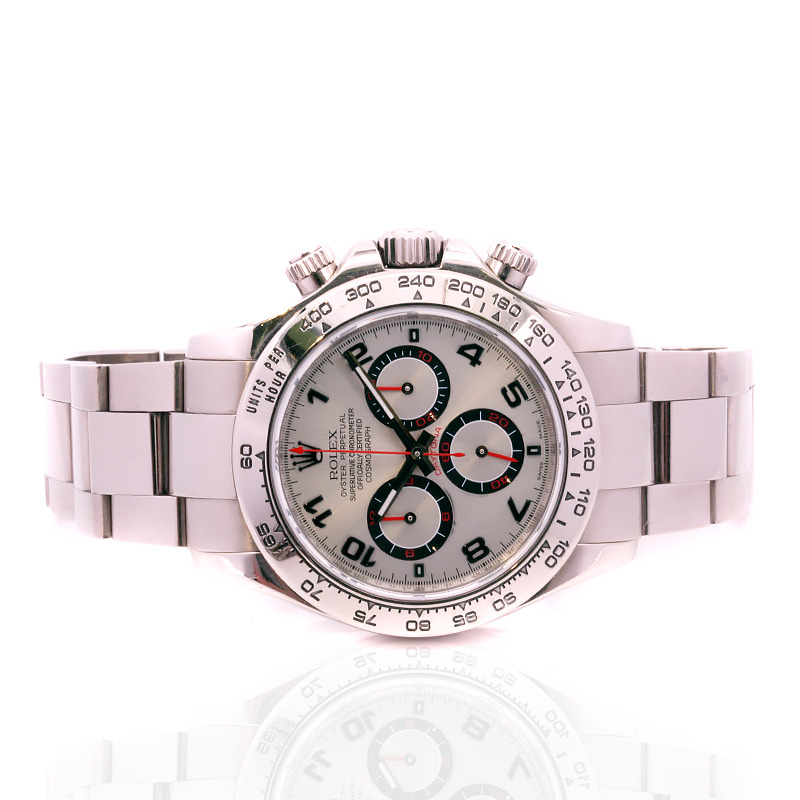 The Rolex Daytona has become one of the most iconic and sought after Rolex models, and here is a spectacular 18ct white gold white dial Rolex Daytona reference 116509. Made in solid 18ct white gold case and band, the heft of this watch feels so incredible on the wrist and has a slightly different tone of white compared to stainless steel. With the stand out dial with numerals instead of index markers, it also has the red centre hands as well as red sub-dial hands which truly stand out against the black and white on the dial. This is one Rolex Daytona dial that is so incredibly good looking on the wrist and will always look superb day or night. Fitted on the solid 18ct white gold Rolex Oyster band, the Rolex case measures 40mm across plus the Rolex screw down crown and pushers. Inside is the 44 jewelled automatic Rolex calibre 4130 that keeps superb time and comes with our twelve month warranty. The Rolex Daytona is such a spectacular looking watch, and this one made in 18ct gold has a brilliant heft and feel to match. The Rolex Daytona is one of the most sought after watches by Rolex. An iconic looking watch, the Rolex Daytona is becoming one of the fastest appreciating watches by Rolex.